Some times we need to configure a virtual host setting for our server. This is required in case when we have 2 server, where one is main server and other is standby server. If the main server goes down then standby server can take over the control and user does not have to change the URL. That means we can have same host name but different IPs (or different physical machines). Other situation is when we want to host multiple web sites on a single host. In this case IP address remains same (means physical server is only one) where as we can have multiple hostname configured for the same. The first example (same hostname and different IP address) is called IP based virtual host and the second example (same IP address but multiple hostname is called name based virtual host). IP based (Same hostname – multiple IPs. Used in backup or standby situation). We will see here how to configure name based virtual host. That means we will be able to refer to our server with 2 URLs or 2 hostnames. Configuration of virtual hosts needs simple change in httpd.conf file. We can do it using Enterprise Manager or through backend by directly editing http.conf file. We will see both the options here. Before starting the virtual host configuration, we need the hostname recognized by server. For this we need to make entry in our /etc/hosts file as shown below. 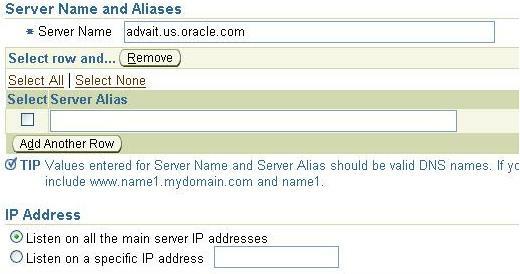 Here 144.25.76.171 is the actual IP address of the host, followed by advait.us.oracle.com, which is the hostname and domain name and finally the hostname. These changes needs to be made as root user. You can create a new port on which you HTTP server can listen. Actually this steps can be skipped and you can use existing port for new virtual host. But just to avoid confusion we will create a new port for virtual host. You can add “Listen 9988” (ignore double quotes) to your http.conf file of middle tier and bounce the http server for middle tier. Here port number I have selected is 9988, but you can select any port that is free. From Enterprise manager you can go to Mid Tier home page -> HTTP_Server component -> Administration tab -> Server Properties. Here you can see “Listening Addresses and Ports” section. You can just add a row and put the new port number as shown in below figure. Scroll down to the bottom and click on Apply button. It will ask to restart HTTP server. Click on yes. In case if you are doing manual changes, do remember to bounce the HTTP server using OPMN. Step 2) Got to Virtual Host section using Mid Tier Home -> HTTP Server component -> Virtual Host tab. Click on “Create” button. It will take you to next screen. Here you have to enter “DocumentRoot”. Enter some different path (Other then htdocs). This way we can keep the content of virtual host with our main server. This is useful in hosting 2 different website on same server. Step 3) Next it will ask you to enter the name of new virtual host that you want to create. You enter the name that you entered in /etc/hosts file above. Below fig shows the same. Also it will ask for which IP address to listen to. You can just enable it for all IP address. Else you can provide specific IP address and it will listen for that IP address and port number only. Step 4) In this step it will ask for the port number to listen to. If you remember in step 1) we created a port number to be used for virtual host. You can select the same port from option 2 as show below. Step 5) This is the last step in virtual host creation, where it will ask for log file location and log level. It will be better if you give some identified name for log file so that you will come to know later. Else better to create a new directory inside logs directory for virtual hosts log files. Finally it will show the summary of the inputs and you can submit the same. This will add entry in http.conf file and then bounce HTTP server so that changes takes effect. This will put the entry in httpd.conf file as given below. Listen 9988 was added when you created a new port for virtual host setup. This will display index.html if present in you DocumentRoot for virtual host. In case of manual configuration we just put the Virtual host configuration directive in httpd.conf file of mid tier Apache and bounce the apache. This will enable virtual host setup. The step to add hostname entry in /etc/hosts holds true in manual configuration as well. It is very good and great. Thanks a Lot. It is very useful since am a fresher helped me a lot…. Advait your website is really good ! Thanks for the feedback. Sorry about the formatting. While posting the format was good, not sure how it got disturbed. This could be wordpress issue also. Appreciate for visiting my blog ! !